Sign your company up for a complimentary group ride! Neon Cycle + Strength was built to be a place where there is something for everyone. Whether you are a hard-core indoor cycling enthusiast or just starting out, we have indoor cycling classes that will help achieve your health goals regardless of your fitness level. Our indoor cycling studio is equipped with 44 of the newest model Stages bikes to give you the ultimate cycling experience. Are you Power-Hungry? Neon Cycle + Strength has you covered! We not only offer the best indoor cycling studio in North Texas, we also offer the best equipped HIIT (High-Intensity Interval Training) fitness studio. Our trainers will help you build the strength and the body you have always dreamed of. Our fitness and strength studio has 13 Precor treadmills and 13 floor spots for a total of 26 spaces for our power-hungry customers. Neon Cycle + Strength offers additional amenities such as child-care while you work out and a full smoothie bar to help you refuel afterwards. 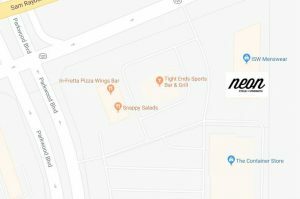 Neon’s indoor cycling studio offers innovative, unique and energetic classes! You will find 44 of the best indoor cycling bikes in the industry all under one roof. Come join our rhythm-based classes led by our expert team of instructors. They will help you achieve your fitness goals and you will have a lot of fun along the way! Neon’s Fitness & Strength Studio concentrates on enhancing your full body strength. Although every class works the core muscles, we individualize classes to concentrate on specific muscle groups. Our fitness and strength instructors will have you alternate from 10 minutes of cardio exercises on our Precor treadmills to 10 minutes of floor exercises using weights to build specific muscle groups. Our incredible smoothie bar is stocked with the freshest fruits and vegetables as well as the healthiest supplements. Reward yourself after a hard workout by refueling with what your body needs. Place your order for your favorite smoothie before your workout and we will have it ready when you are done. Neon knows that you have a demanding schedule that makes it difficult to find “me” time. That’s why we have a child care facility that will care for your little ones while you take care of you! Neon Kids will have activities to keep kids busy and their minds stimulated.